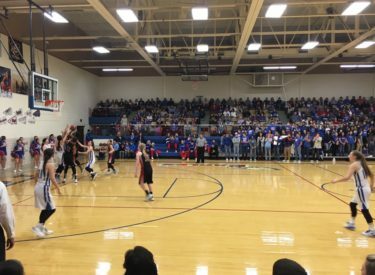 Hugoton is 13-0 after a 58-43 win over visiting Liberal Friday night in front of a packed house in Hugoton. It was Liberal’s first trip to Hugoton since 2000 and first meeting since 2014 in the Colby Orange and Black Classic. The Lady Eagles led 15-11 after one quarter and 30-21 at the half. they controlled the second half leading 46-32 after three. Hugoton was 6-17 from three point range and 7-11 at the foul line while the Lady Redskins were 16-22 at the foul line and 2-12 from three point range. LHS head coach Carter Kruger laments the fact that the Lady Eagles gathered in 11 offensive rebounds. Dallie Hoskinson scored 22 while Katy Heger scored 14. Amy Scott added nine. Liberal’s Jada Mickens had 12 while Machia Mullens had 11 and Whitney Hay had eight. Hugoton is 13-0 and hosts Holcomb on Tuesday while the Lady Skins are 10-3 and play at Great Bend Friday at 6 on 1270 and kscbnews.net. LHS and Great Bend are 3-0 in the WAC. The three teams who defeated LHS(Northwest Classen, Salina Central, and Hugoton) are 40-2.